If you're looking to set up a planted shrimp tank, hornwort (Ceratophyllum demersum) is one of the plants you might consider. This easy plant is perfect for the beginning plant lover and will be appreciated by all types of shrimp. 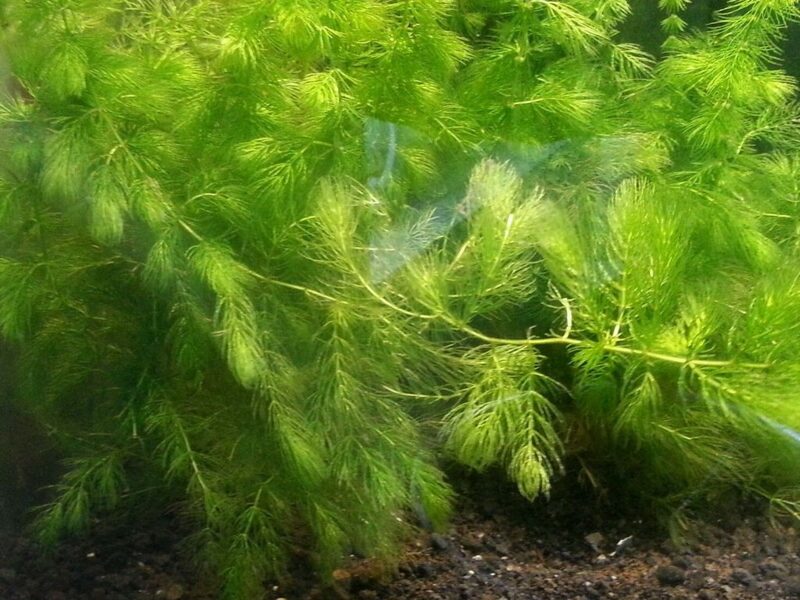 Keep reading for everything you need to know about growing hornwort in your aquarium! Hornwort is not too difficult to grow and this plant is actually known for its very fast growth. It will adapt to almost all water values and tolerates a wide range of temperatures, which makes it a great plant choice for unheated shrimp tanks. Added Co2 and fertilizer aren't necessary, although hornwort does appreciate these and will respond by growing faster and fuller. Use medium light to keep this plant healthy; very high or low light conditions can cause shedding and result in a rather ugly plant. When planting hornwort, keep in mind that this is naturally more of a floating plant. Although it can be planted in the substrate it might start losing its bottom leaves after a while, which doesn't look too great. You can prevent this by just letting it float free or by cutting off and replanting the full tops once the bottom of the stems start looking too bare. Although hornwort leaves are very fine, they are quite hard and not very easy to eat, which prevents the plant from falling prey to most herbivorous fish. Hornwort has many uses in the aquarium. Its feather-like leaves and bright green color make it a decorative addition to planted tanks, but there's more! Its fast growth and need for plenty of nutrients make hornwort a great nitrate buster and many aquarists actually use this plant to help keep their water values stable. You'll still have to do regular water changes, but a buffer is nice, especially if you keep fragile shrimp species. Because hornwort can be grown as a floating plant, it can be used to dim the lighting and create a natural look in the aquarium. Hornwort makes the perfect hiding place for young shrimp and fish. If you're interested in breeding shrimp in a community tank, growing fine-leaved stem plants like this one can really help keep the fry survival rate up. Young shrimp can hide between the fine leaves and feed on infusoria until they are large enough to forage out in the open. As discussed earlier, hornwort is one of the few plants that can withstand "attacks" by herbivorous fish such as goldfish. Its leaves are too hard to eat and its fast growth makes up for any damage. This makes it a great option if you find other plants are being eaten too quickly. Propagation: Propagating hornwort is not difficult at all. As with many other stem parts, any part of the plant can be cut off and regrown. This means stem tops can be reused after pruning and you can also remove side shoots or any other part of the plant to propagate it. The Shrimp Farm sells hornwort and ships it right to your doorstep. You can order hornwort online from The Shrimp Farm here!